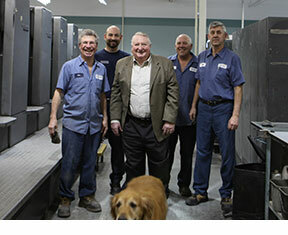 Today Annan & Sons is proudly recognized as a family-owned printer of premium quality. 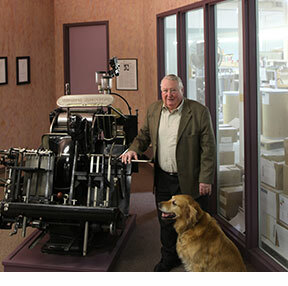 The Annan & Sons story starts with Don Annan; printer, entrepreneur and family man. Ten years after Don started his trade print shop, son John stepped up to take over the front office. In his mind, in his heart, Don knew that between existing clients and overflow projects from other printers he could keep his new Heidelberg Sheet Fed 40" five colour press busy enough to pay back the debt. Men of Don's generation knew that a business free of debt can provide a living through all kinds of economies. Don also knew the importance of service, quality and price – foundational basics that set companies apart 35 years ago and still today. Having five sons work in the family business was Don's dream. Soon Don's other four sons entered the business and Annan & Sons was established for all time as a family-owned printer of premium quality. Today the Annans control every aspect of a print project from prepress to delivery and direct mail. Annan & Sons is not a pretentious operation - this isn't a pretentious family. But if you prize quality work and a sound, long-term relationship, Annan could be your printer of choice. Flash forward and Don has gone fishing. Thirty-five years later, Don Annan has retired and his five sons, John, Mark, Paul, Brad and Steve run the business with the very same sensibility of service and quality that Don inspired. 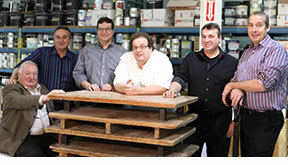 The Annans along with a team of dedicated print experts, hold fort at Annan and Sons plant in Etobicoke, Ontario. Don is still involved - from a distance. Don comes up with business ideas while he fishes and cuts his grass. He is known to hop off his mower and phone the boys with an idea. You see, Don doesn't believe in texting or emailing, he wants to pick up the phone and talk. Don knows the importance of relationships, direct contact and the sound of the voice. It's this personal flavour that makes this company special. Who are the Annans? They could be you. Today Annan & Sons looks more like this [at left] on a day when Don and dog, Howie, drop in. Click here to see much younger Annans.